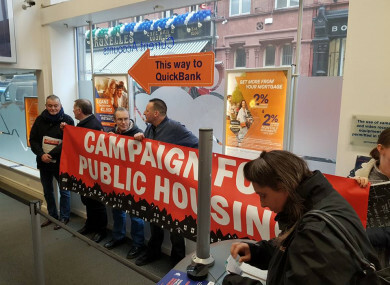 THE GRAFTON STREET branch of Permanent TSB was occupied by protesters voicing their opposition to the proposed sale of distressed mortgages to vulture funds today. The Campaign for Public Housing staged the lunchtime occupation to protest against the bank’s proposed sale of 18,000 properties to vulture funds. Dublin South Central TD Joan Collins was one of a number of politicians who attended the protest. “This sale is just the beginning. If it’s allowed to go ahead, Ulster Bank and many others will take it as the starting gun to begin similar, mass sell-offs of any mortgage not making them enough profit,” she said. Our occupation here today is intended to show the government that, if these loans are not stopped, there will be a fight back. PTSB, which is 75% state-owned has previously defended the plan to sell-off its non-performing loan book. The proposed sell-off includes 18,000 properties, 14,000 of which are private dwellings. Late last month another group of demonstrators delivered a coffin to the bank’s headquarters in opposition to the plans. Permanent TSB had no comment to make about today’s demonstration. Email “Grafton Street branch of PTSB occupied by anti-vulture fund demonstrators”. Feedback on “Grafton Street branch of PTSB occupied by anti-vulture fund demonstrators”.